Infiniti has made a handful of major upgrades to the Q50 for the 2016 model year in a bid to lure buyers away from BMW and Mercedes-Benz showrooms. The big news is that the Nissan-owned car maker is finally taking performance seriously. 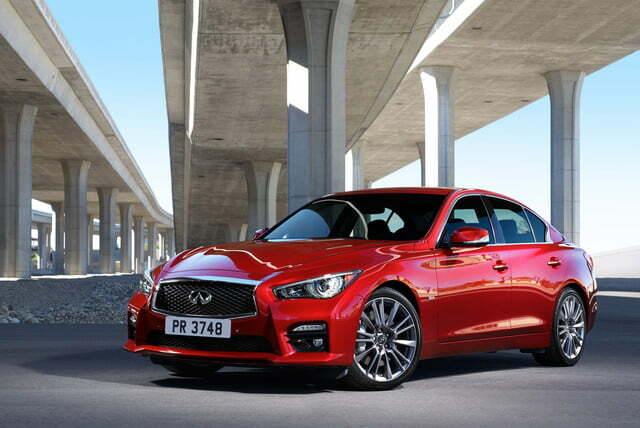 It has expanded the Q50 lineup with a range-topping model called Red Sport that’s powered by a brand new twin-turbocharged 3.0-liter V6 engine tuned to develop 400 horsepower at 6,400 rpm and 350 pound-feet of torque from 1,600 to 5,200 rpm. The six spins the rear wheels via a seven-speed automatic transmission, but performance figures haven’t been announced yet. Don’t need 400 ponies? Infiniti has you covered with a detuned version of the 3.0-liter V6 that sends 300 ponies and 295 lb-ft. of twist to the rear wheels via a seven-speed automatic transmission. The 3.0-liter replaces the Nissan-sourced 3.7-liter six currently offered in the Q50, and in a long list of other Infiniti models. 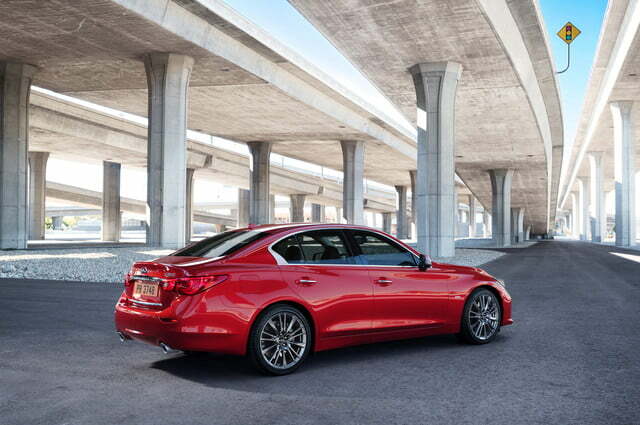 Base cars gain a 2.0-liter turbo four that generates 208 horsepower and 258 lb-ft. of torque, while buyers who prioritize fuel efficiency can order the Q50 with a 360-horsepower gasoline-electric hybrid drivetrain made up of a 3.5-liter V6 and a 50-kilowatt electric motor. All versions of the Q50 regardless of how many cylinders are under the hood can be configured with all-wheel drive at an extra cost. 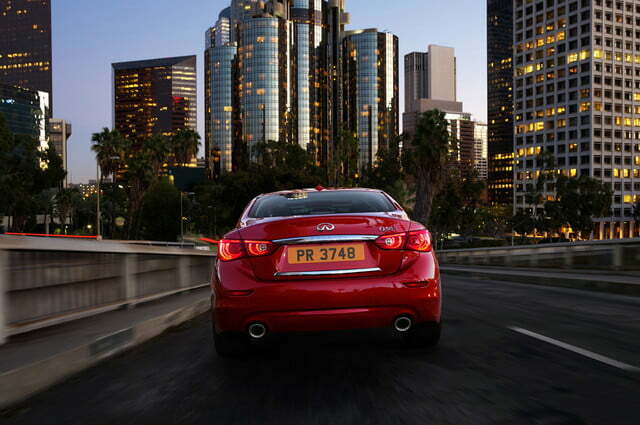 Beyond the engine bay, the Q50 gains the second generation of Infiniti’s Direct Adaptive Steering (DAS) system. In addition to providing the driver with a host of customization options, DAS makes up to 1,000 steering adjustments per second to ensure the sedan is easy to maneuver at high speeds and more engaging to drive on twisty roads. Infiniti promises its digital steering technology goes a long way in reducing driver fatigue, too. All versions of the 2016 Q50 ship with a Dynamic Digital Suspension system that lets the driver choose whether the ride is comfortable, sporty, or something in between. Using sensors, the state-of-the-art suspension system helps the Q50 corner flat and protects the occupants’ spines by soaking up bumps in the road before their effect can be felt in the cabin. 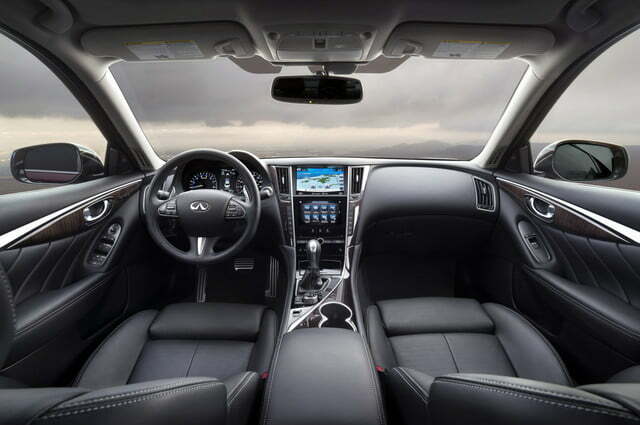 The 2016 Infiniti Q50 will be presented to the public next month at the Detroit Motor Show alongside the all-new Q60 — which is almost certain to get the 400-horsepower V6 — and the face-lifted QX60. It will go on sale nationwide shortly after it greets the show-going public in the Motor City.